^ a b Clute, John; Grant, John, eds (February 1999) [First published 1997]. “Steampunk”. The Encyclopedia of Fantasy. Contributing editors: Mike Ashley, Roz Kaveney, David Langford, Ron Tiner (Rev. ed.). New York: St. Martin's Griffin. pp. 895–896. ISBN 978-0-312-19869-5. "STEAMPUNK A term applied more to science fiction than to fantasy, though some tales described as steampunk do cross genres. 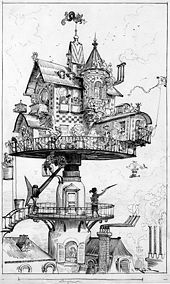 ... Steampunk, on the other hand, can be best described as technofantasy that is based, sometimes quite remotely, upon technological anachronism." ^ a b サイドランチ(編) 2015, p. 4. ^ ロブ & ブレイロック 2014, p. 145-146. ^ Daniel, Lucy (2007). Defining Moments in Books: The Greatest Books, Writers, Characters, Passages and Events that Shook the Literary World. US: Cassell Illustrated. p. 439. ISBN 1844036057. ^ Kaplan, Janet (2010). Remedios Varo: Unexpected Journeys. Abbeville Press. ISBN 0789206277. ^ a b c d Grossman, Lev (2009年12月14日). “Steampunk: Reclaiming Tech for the Masses”. Time. http://www.time.com/time/magazine/article/0,9171,1945343,00.html 2009年12月10日閲覧. "Steampunk has been around for at least 30 years, with roots going back further. An early example is K. W. Jeter's 1979 novel Morlock Night, a sequel to H.G. Wells' The Time Machine in which the Morlocks travel back in time to invade 1890s London. 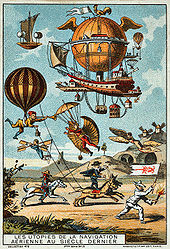 Steampunk — Jeter coined the name — was already an established subgenre by 1990, when William Gibson and Bruce Sterling introduced a wider audience to it in The Difference Engine, a novel set in a Victorian England running Babbage's hardware and ruled by Lord Byron, who had escaped death in Greece. ..."
^ Nevins, Jess (2003). Heroes & Monsters: The Unofficial Companion to the League of Extraordinary Gentlemen. MonkeyBrain Books. ISBN 193226504X. ^ Csicsery-Ronay, Istvan (March 1997). “The Critic: John Clute. Look at the Evidence. Essays and Reviews.”. Science Fiction Studies (DePauw University, Greencastle Indiana: SF-TH Inc.) (#71; Volume 24, Part 1). http://www.depauw.edu/sfs/reviews_pages/r71.htm 2010年11月29日閲覧。. ^ スチームパンク東方研究所(編) 2012, p. 151. ^ ロブ & ブレイロック 2014, p. 149-156. ^ “Steampunk Tree House debuts at Dogfish in Milton”. Cape Gazette. (2 July 2010). オリジナルの2010年7月6日時点によるアーカイブ。. 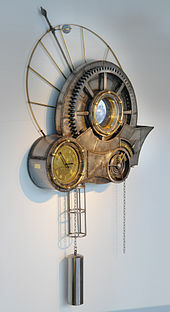 https://web.archive.org/web/20100706081744/http://www.capegazette.com/storiescurrent/20100701-15/02003-dogfish-steampunk.html. ^ Campbell, Jean (2009) Steampunk Style Jewelry: A Maker's Collection of Victorian, Fantasy, and Mechanical Designs. Creative Publishing International ISBN 978-1589234758, pp. 48.